I have two lemon trees in my garden in Cyprus and am always fascinated to see the full range of its botanical life cycle from buds to final fruit on the tree all at the same time. It seemed an ideal candidate for a botanical drawing. I decided to try out a technique of Lola Jenkins involving a drawing and an overlay. 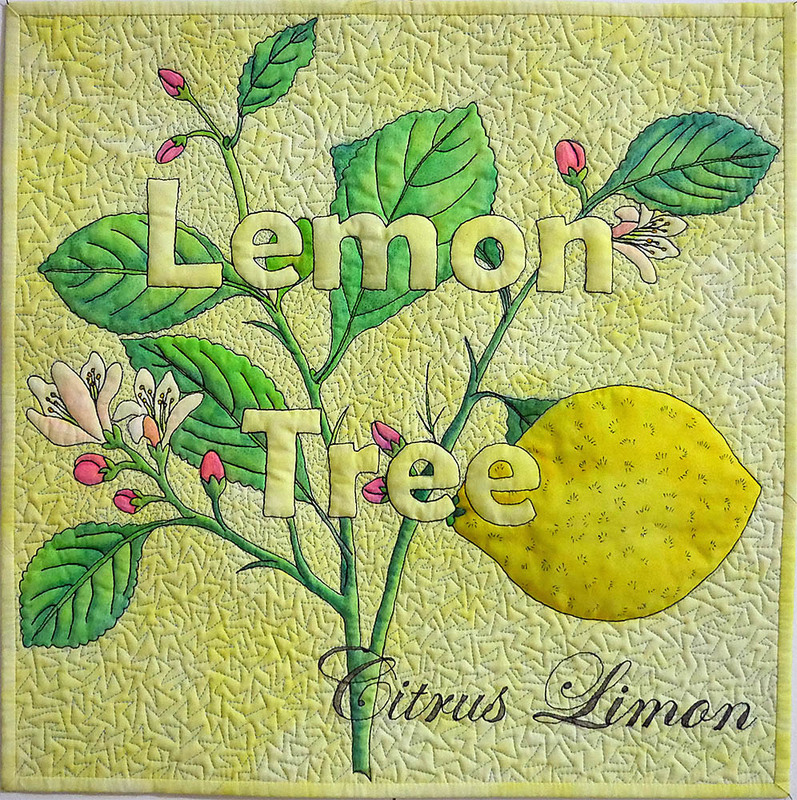 I have used the words Lemon Tree and it’s botanical name Citrus Limon as the overlay. This was marked with a permanent pen onto my background, which I had previously fabric painted with a light colour wash. I then traced my drawing onto the background with the permanent pen, making sure not to make any marks inside the overlay. Using a black trilobal thread the overlay markings were stitched, using a very thin fusible fleece as a stabaliser. This top was then layered up using a cotton fleece and backing and all the marked lines of the drawing were stitched using the same black thread. For the background fill I decided to use a pale blue thin cotton thread and one of my favourite designs. Once all the stitching was finished it was time to give a light colouring to the drawing. Lola uses crayons and fabric medium. I was very pleased with the results and feel it looks like a watercolour wash to the drawing. I am completely blown away by your script on this piece, Gaye. It’s lovely! Stunning Gaye. The overall design, painting, and the intricate background stitching and script blows me away too. 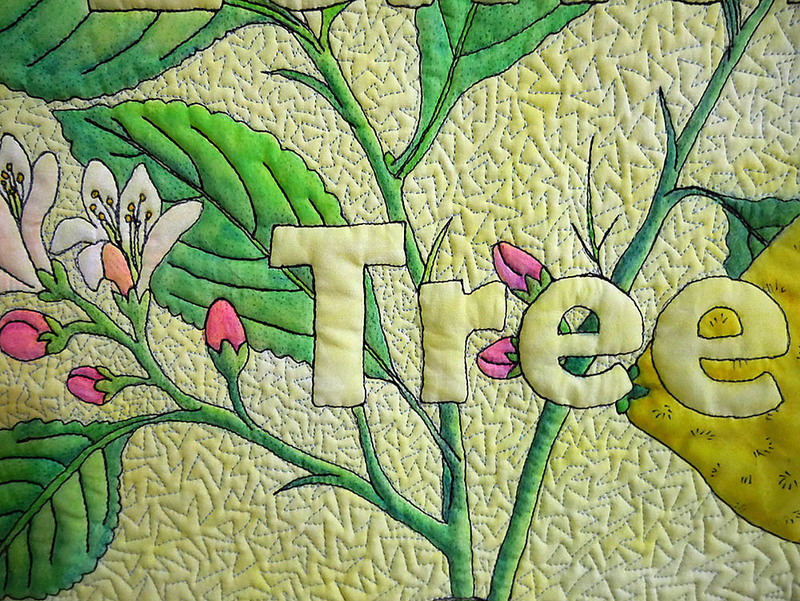 What a nice quilt, the colours, the composition and the technique you used match perfectly together. It really is an eye-catcher, well done. 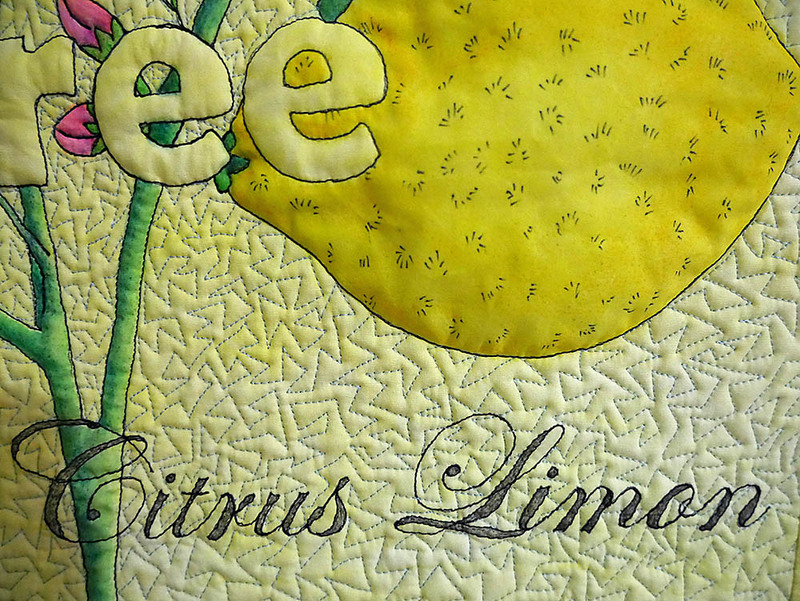 I am truly in awe of the accuracy and neatness of your drawing and painterly techniques you have used on this quilt. The stitching is wonderful, and the overall effect is beautiful. Well done. The colours certainly say “citrus”. Very precise. Wonderful design, Gaye! And I love the colors. A super design and I think the painting is just so well done.